The Life Aquatic: It’s bad…Like Water…Being Underneath It…. I wasn’t born with one of those nifty brain filters that prevents you from spouting out total nonsense. As a result, I am known among my close friends and family for sputtering out fragments and run-ons that just make no sense at all. One time during a long car ride, maybe to California, my sister and I were relaxing in the backseat make-shift campsite we had become accustomed to putting together for these road trips. At some hideous, heart-stopping, stomach curdling moment….OUR BARE FEET TOUCHED. It still makes me shudder to remember it. I yanked my feet back and screamed “DON’T TOUCH MY FEET! !” She looked at me in shock which prompted me to explain in near hysterical tones, “Bare feet touching is bad! It’s like water! !” And which point she erupted into laughter and forced me to explain how water is bad, let alone anything at all like bare feet touching. Well, I was still horrified (quite the little drama queen, I know…) So in total frustration I said “It’s like water….being underneath it! !” Apparently this didn’t clarify anything for her, because she just erupted into laughter again, and promptly decided that this would be a catch phrase for the Baugh sisters forever more. What she didn’t know is how terrified I had become of being underneath water. Something about having people sit on my shoulders with my head under water….being trapped underneath docks….waking up from a nap underneath the surface of the deep end of the pool….all this had led to a phobia of having my head under water. Go figure. Fast forward to my mid-teens and you’ll find a young lady who wanted nothing to do with fear. I don’t actually remember what it was that changed in me, but I remember deciding I didn’t want to be afraid. One by one, I started tackling my fears. I made myself go on the zipper at the carnival to deal with my fear of heights. Eventually I made my way all the way to Las Vegas to ride the Big Shot on the top of the Stratosphere (a mere 1,000 feet in the air). When I was 15, we took a family trip to see my mom’s family in Southern California. While there, my dad decided to pick up surfing again. He took me out into the surf at Newport Beach. I’m not totally sure he knew about my phobia at this point…but he sure did afterwards. In my mind, which surely has a skewed perspective, the massive storm surf tried to eat me alive, decided I wasn’t the right snack, and spit me back out on the beach a snotty, sputtering, sand covered mess. I’m sure in reality the waves were a couple of feet…but these details are minor. What matters is that I wasn’t about ready to let that ocean be the boss of me! Later that day, Dad bought a surfboard and we drove down to San Onofre. He took me out into the surf where I screamed and yelled and cursed, but tried and tried and tried. Eventually, I managed to catch my first wave and ride it into shore. Imagine my disappointment when pictures proved later that my “wave” was, in fact, about 1 foot of foam…. But I was hooked. Maybe I could barely swim, and perhaps I had total chest-stopping panic every time I wiped out and went under water (which was often), but I was addicted nonetheless. Eventually I worked up to snorkeling – which I realize might seem backwards, but with surfing my face was only submerged for a few seconds at a time. Snorkeling requires your face to, you know, be IN the water. It’s the whole point of it. During a trip I took to Belize I went out snorkeling in some very calm, very clear, very shallow water. Even though this was almost as safe as snorkeling in a swimming pool, I felt panicked enough to stop about every 20 feet, lift of my mask, find land, breath, lather, rinse, repeat. Boy were my friends ever irritated with me. But four terrifying hours later, I felt I had accomplished another step in my mission to overcome my biggest fear. A lot of time passed before I pushed myself forward again. Ten years, to be exact. 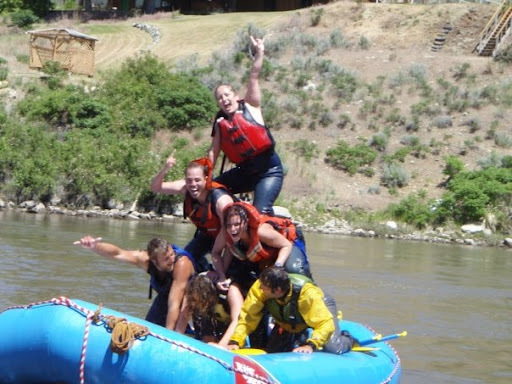 Last year some friends of mine convinced me to go on a rafting trip. I researched a lot, and decided it wouldn’t exactly be cheating death, so I decided to go. At first I felt that same fist gripping my stomach. I breathed deeply and plunged ahead. About halfway down the river I realized I was having a blast and I very likely wasn’t going to die on this Class II rapid. I even made my way to the bow of the raft to feel the ice cold water splash my face every time we smashed down a rapid. One of the Yay Rafting! traditions is to jump into the river off a rock that is maybe 8-10 feet high. They told me if I was going to jump, I needed to land right on the border of the current and the eddie, and then swim like hell back to the beach. It took me a few minutes to actually jump, but finally I did it. I found myself mid-air, totally shocked that I’d actually jumped, and then even more shocked by the ice cold glacial run-off that bit my face as I went under. Once again, however, I’d looked water right in the face and lived. Presently, I live surrounded by water quite literally. 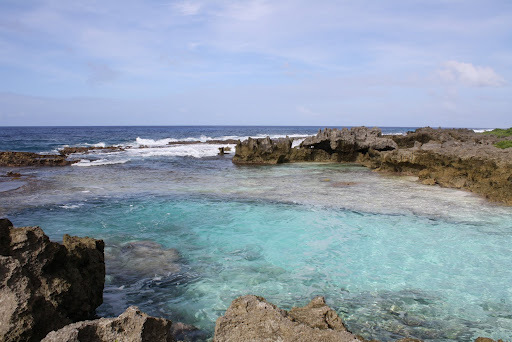 When it comes to outdoor recreation on Rota there are two choices: you can hike or you can swim/snorkel/dive. I knew when I moved here that I would have to face my deepest fears. 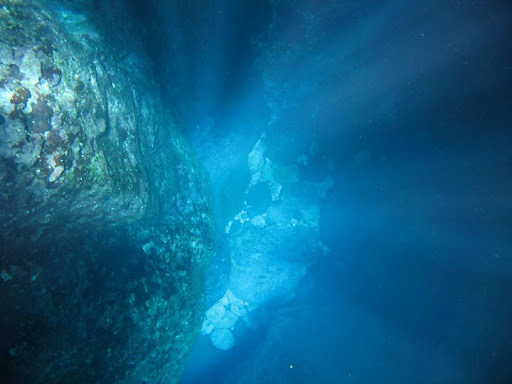 Not because there is someone making me, but because I have too much pride to come to one of the greatest dive spots on the planet only to end up saying “I couldn’t, I was scared.” So, once again I’ve been taking baby steps. First, I snorkeled inside the reef. Then one day I managed to go outside the reef with my friend Noe. Snorkeling inside the reef was no big deal – there are no currents or riptides that could drag me helplessly out to sea….But outside the reef…I admit I panicked a little when I lost sight of Noe’s flippers. I did have to stop every so often to double check that I wasn’t already half way to the Philippines. I watched in awe as Scott dove down 20 feet or more, hovered with his spear gun looking for fish, then resurfaced only to do it again and again. “How do you just hold your breath like that?” I thought. I know Scott spends most of his off time free diving, but watching the process both fascinated and terrified me. Truth be told, I am jealous. I want to do that – but it is still so scary. After a little bit, I lost sight of Scott again, and because I was getting stung by hundreds of miniature jelly fish (which at first I thought were a special class of underwater bees), I decided to head back to the boat. 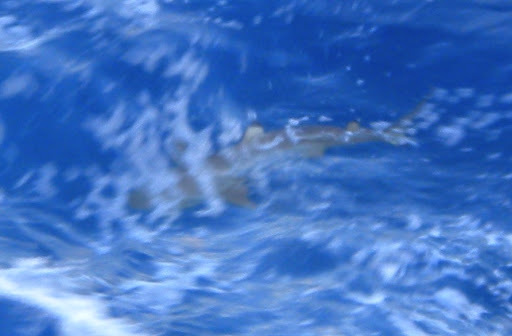 I was about 25 feet from the boat when I saw the shark. This time there was no question about it. It was a shark, and it was big enough to eat my legs and it was swimming right towards me. Something to the effect of “Oh my God it’s a shark and it’s hungry and it wants to eat my legs ohmygodohmygodohmygod” went through my brain. I took exactly two arm strokes before I realized that I would never be able to swim faster than this creature. 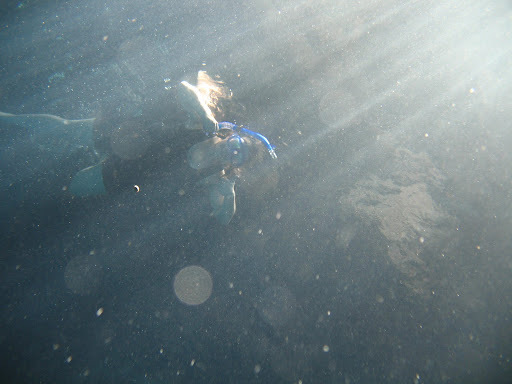 Because you can’t exactly take deep cleansing breaths while snorkeling, I just had to mentally calm myself. I know that shark people and divers are probably laughing out loud at this story because the shark I saw was a little reef shark and not some giant man-eater. But still…my heart pounded in my chest in total contrast to the slow, smooth breast strokes that lead me back to the boat. Exhausted, I gave up snorkeling for the day, but I am still proud of myself, and still thrilled that I had a chance to see a shark that close. I know this is only the beginning. The next I woke up exhausted, but I had promised Noe I would ride up to the swimming hole with him. Swimming hole is a totally different experience than the wide open ocean. 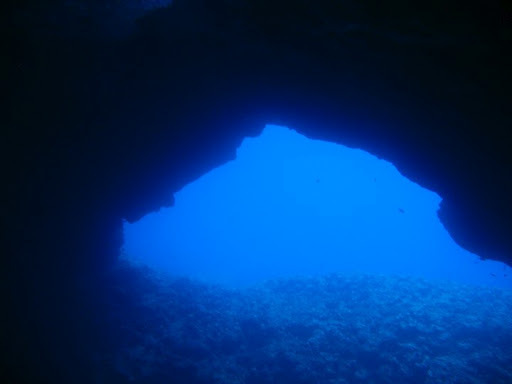 The hole itself is small, and maybe only ten feet deep at the deepest point, if that. It is totally surrounded by reef, and usually very calm. It’s like a small swimming pool/aquarium. I was having a lot of fun just snorkeling around, looking at the fish, generally just frolicking. For some reason I got it in my head that I needed to start practicing free diving. I have seen people dive down with snorkels on but I didn’t understand how it worked. So, I just took a deep breath and dove under. The first time I think I managed to dive about three feet, but I saw a shell I really wanted on the bottom of the hole. That’s when it happened. My brain clicked into gear and I decided that was the moment I’ve been waiting for since I was about ten years old. I would get that shell before I left the swimming hole. Breath after breath I would try with everything I had to swim down to the bottom. Pretty soon, I had it! I managed to dive all the way down to the bottom, stay there, and grab my shell. I was so excited I decided I needed a few more. Five or six shells later, I looked up to see Noe. I know I must have had a ridiculous grin on my face because he wanted to know what treasure I had found. I’m not sure anyone besides my family will ever understand that the treasure I found that day was that being underneath water really isn’t that bad at all. In fact, it’s actually quite spectacular. **From top: photo1 taken at Rota Grotto, CNMI by Scott Moen; Photo2 taken by YayRafting member; Photo3 taken at Rota Grotto, CNMI by Scott Moen; Photo4 taken at Pona Point, Rota CNMI by Tara Martin; Photo5 taken at Swimming Hole, Rota CNMI by Camas Baugh; Photo6 taken at Rota Grotto, CNMI by Scott Moen. All Photos Copyrighted.